The Lord of the Rings | Kris Johnson's Blog…sort of. 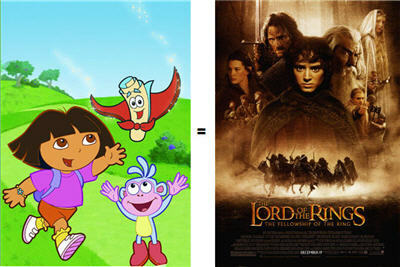 Someone has to say it: Dora the Explorer is a complete ripoff of The Lord of the Rings. Dora is a short person from a fantastical land who is called upon to deliver an item to a faraway place. On her journey (or quest), she must overcome a number of obstacles and often encounters strange creatures. Frodo Baggins is a short person from a fantastical land who is called upon to deliver an item (The One Ring) to a faraway place (The Cracks of Doom in Mordor). On his quest, he encounters strange creatures and must overcome a number of obstacles. Dora is accompanied by a loyal companion (also short) named Boots. Frodo Baggins is accompanied by a loyal companion (also short) named Samwise Gamgee. Dora is often joined by companions of different species: Isa the Iguana and Benny the Bull, to name two. Frodo Baggins is joined by companions of different races: Gimli the Dwarf and Legolas the Elf, to name two. Dora is pursued by Swiper the Fox, a conniving-yet-cowardly thief who wants to steal something she is carrying. Frodo Baggins is pursued by Gollum, a conniving-yet-cowardly thief who wants to steal The One Ring. Dora is eventually joined by Diego, an animal rescuer who is skilled at tracking and outdoor survival. Frodo Baggins is eventually joined by Aragorn, a ranger who is skilled at tracking and outdoor survival. Dora must often solve puzzles using words and phrases in another language (Spanish). Frodo Baggins was unable to enter the Mines of Moria until the word “friend” was spoken in another language (Elvish). Dora has a magical backpack that contains whatever object she might need to solve a puzzle or overcome an obstacle. There’s no magical backpack in The Lord of the Rings, but Dora’s backpack sounds an awful lot like a Bag of Holding from the Dungeons & Dragons roleplaying game (which was around decades before Dora the Explorer), and everyone knows that Dungeons & Dragons is the King of All Lord of the Rings Ripoffs. I’m sure there will be naysayers; those who call this evidence “circumstantial” or “coincidental” and point out that “Nickelodeon” isn’t really an anagram of “J.R.R. Tolkien”. You know: nutjobs. But to the rest of you—those who can see Middle Earth in the unnamed South American country in which Dora resides—I extend an invitation to show me more. Peel the veil further back to expose more proof. What have I missed? What more is there?